When I first re-verted back to my Catholic Faith, I wanted to enthusiastically celebrate EVERY DAY - all of the Feasts, and all of the commemorations and all of the traditions. I quickly discovered that it was best to pick out the feasts and celebrations that helped my family the most and to try to make memories and celebrations around those feast days. 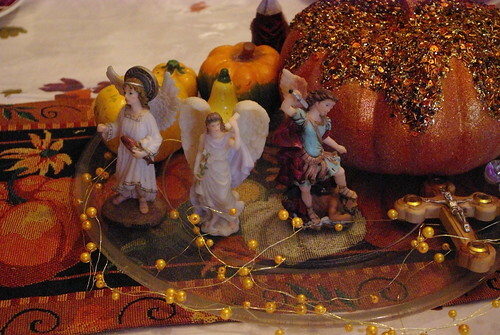 The Feast of the Archangels is one of those feast days. We celebrate it in my family because one of my sons is named Gabriel, and our baby in heaven is named Raphael. When the kids were little we celebrated every year with another family. We would go to their house one year, and they would come to mine another year. It was a lot of fun and it was good for the children. As time went on though, their kids ended up going to Catholic school and with fall activities and dances and other commitments, we stopped celebrating with that particular family. But I didn't want to lose the specialness of this feast day, so we started asking other families and friends to visit with us. So over the years the faces around the table have changed, but we have always made more of a big deal over celebrating this feast day. The Sacred Scriptures have revealed the proper names of only three Angels, all of whom belong to the Choir of the Archangels. The names are well known to all, namely: Michael, Gabriel, Raphael. September 29 was traditionally Michaelmas - the feast of St. Michael. We now recognize all three archangels on this day. From fairly early on, Michaelmas was an important holiday, the religious or Christian equivalent of the autumn equinox. In England, it was considered the start of a new quarter. It marked the start of a new business year, a time for electing officials, making contracts, paying rent, hiring servants, holding court and starting school. From Revelation we learn of the battle in heaven, with St. Michael and his angels combatting Lucifer and the other fallen angels (or devils). We invoke St. Michael to help us in our fight against Satan; to rescue souls from Satan, especially at the hour of death; to be the champion of the Jews in the Old Testament and now Christians; and to bring souls to judgment. It has took me some time to get statues of all three archangels. When I had the money, I bought them. This year Rosie is going to make the peg saint versions of them as well. 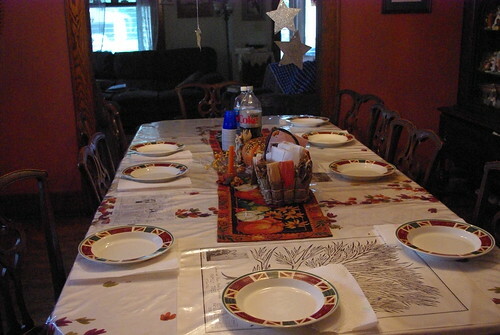 Here is what our table looked like last year for dinner on the feast day. We have a traditional Angel Hair pasta chicken dish, deviled eggs, angel food cake and some other goodies. And I have it on good authority that this is why my adult kids are making a special effort to be over for dinner tomorrow!